Dallas Blacklaw is an indoor cycling pro who reaps the rewards by taking his indoor cycling skills on the road. As a triathlete and personal trainer, Dallas Blacklaw saw indoor cycling as another chance to up his game. He became an RPM™ instructor nearly 10 years ago and swears by his cycling routine for keeping fit enough for anything life throws his way. If you don’t think studio pedal power can help you pound the pavement or compete in that cycle race that’s always been on your bucket list, think again. The fitness you gain from RPM is transferable to other sports. Dallas knows from experience that you can get big benefits training for anything up to a half marathon with RPM. Dallas trains for running races, using RPM to build strength and endurance. The fact that indoor cycling is low impact, easier on your joints and gives greater support for your knees makes it the perfect choice to complement high impact activities. If you love being outdoors on your bike, RPM also makes a great match with mountain biking or road cycling. Just ask Dallas, who put his theory to the test by training purely with RPM for a 50 kilometer (30 miles) mountain biking event. He smashed it. 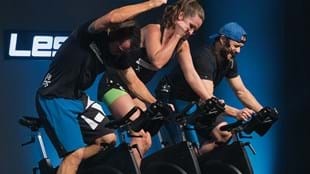 If you’re not ready to hit the road or trail just yet, but would love to get out there someday, Dallas says an indoor cycle workout is a great place to start. It doesn’t have to be a marathon or mountain bike race. You might just want to get fit and feel self-assured enough to get outside for a walk, or play with your kids. Are sugar cravings a thing? And if so, how can you beat them?